It’s a nuclear reactor fused to bits of orange piping and two racing wheels. 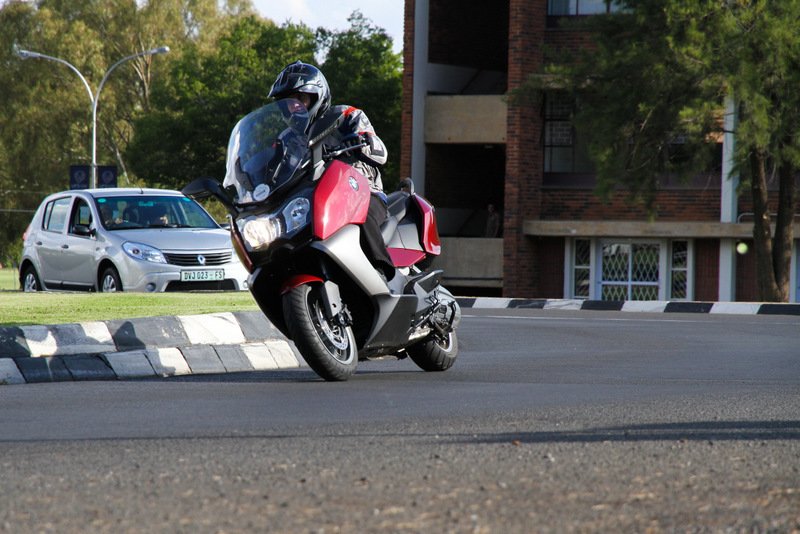 It’s the bike that settles all arguments with three bullet points: 132kW, 144Nm, 189kg. 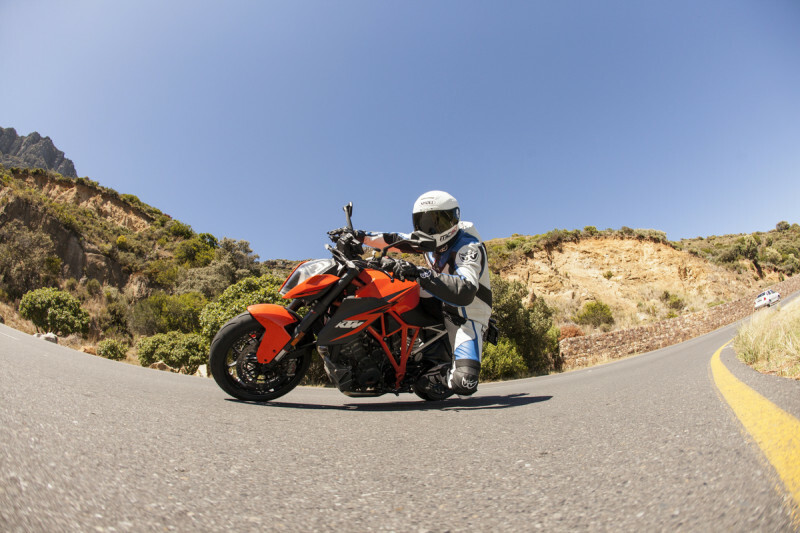 It’s KTM’s maddest, baddest naked bike and the most powerful production motorcycle that they have ever made. 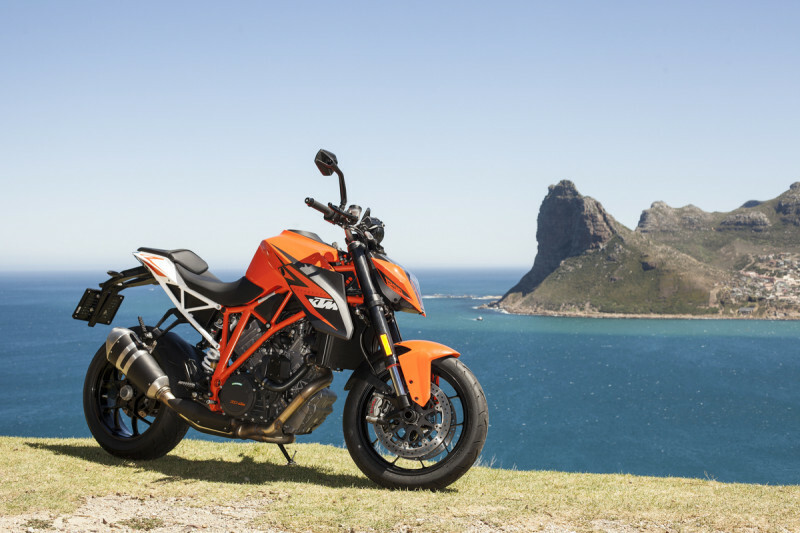 Like KTM’s adventure bike that thinks it’s a superbike, the 1190 Adventure, the 1290 Super Duke R also gets its engine from the company’s RC8 1190 superbike. But as the Duke’s full title suggests its engine – bore and stroke – was enlarged to 1301cc. Then it was endowed with new cylinder heads and cams as well as new pistons and a crankshaft that weigh about as much as a cobweb. Twin balancer shafts have the job of reducing vibration, but I’m happy to report that the motor still feels angry and alive. To keep its insides lubed, whether you have one knee or both knees down, it has forced oil lubrication with three rotor pumps. Before it became the 1290 Super Duke R it was simply called The Beast and it’s wild styling (it makes the BMW S1000R look as mean as a Raleigh Bomber) had bike fans in a frenzy. The headlight cluster has a Deceptecon or Iron Man look to it and is flanked by two “floating” plastic fairings that look like daggers − or the mandibles of a praying mantis, about to devour anything in its way. The LED daytime running lights have a double-horseshoe shape. In profile its lines angle sharply downward and create the impression that it’s fast yet planted to the road. The orange-coloured frame and white-piped sub-frame to the rear give it a bare-knuckle, industrial look. The pillion seat isn’t meant for 500km breakfast runs, but is more useful than the token typical of superbikes. The rider is well catered for and my 1.96m frame didn’t feel squashed. Overall it looks mean, but not scarier than Kawasaki’s Z800 or Honda’s CB1000R. 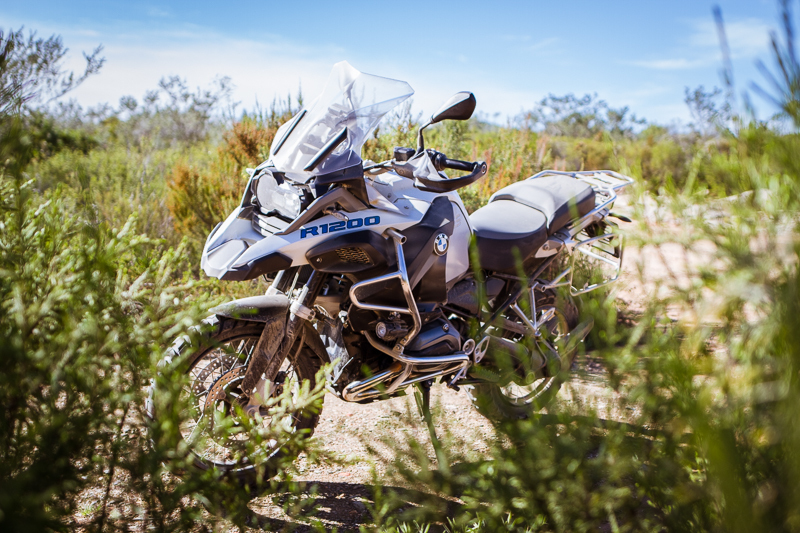 The instruments look identical to those on the 1190 Adventure. They consist of an analogue rev counter flanked by two LCD screens. The one on the right shows your speed, the gear selected, riding mode (street, sport or rain), coolant temperature, fuel level and clock. 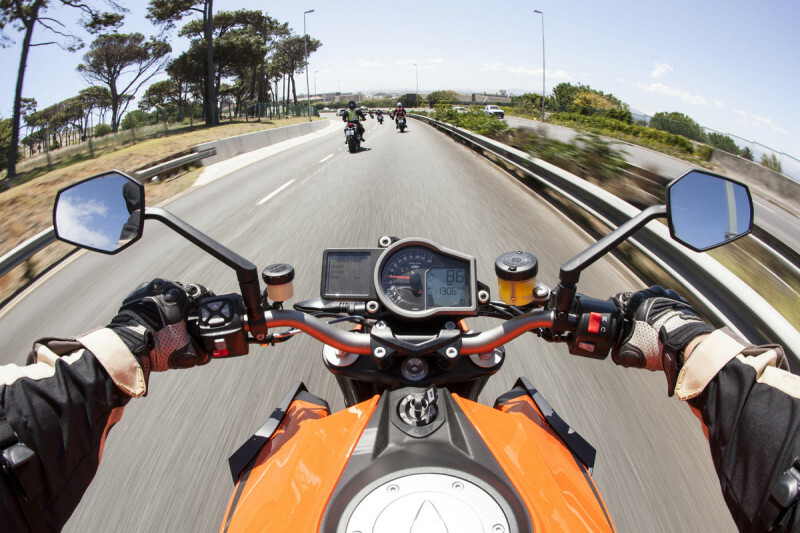 The LCD screen on the left shows the rider’s preferences (ABS and traction control modes) the air temperature, trip computer and odometer. If you delve deep enough in the menu settings you will also find Candice Swanepoel’s phone number. On the launch in Cape Town I got so carried away by The Beast that I missed the group photo session on Chapman’s Peak. I was possessed by the sound and fury of the machine and I only snapped out of it at the end of Ou Kaapse Weg. By then I’d discovered two important things: Firstly, that I didn’t do accidental wheelies like the first time I rode a Yamaha R1 superbike. The traction control system inhibits such hooliganism unless turned off. (I don’t do wheelies.) Secondly, that the Duke’s power is immense, but feels usable, manageable and predictable. It enquires whether you want one, two or four sticks of dynamite under your backside and you answer with the throttle position. On top of that, the rider can choose between Street, Sport or Rain modes. The traction control cuts in eagerly in Rain mode, stands back in Street and watches you from a distance in Sport mode. 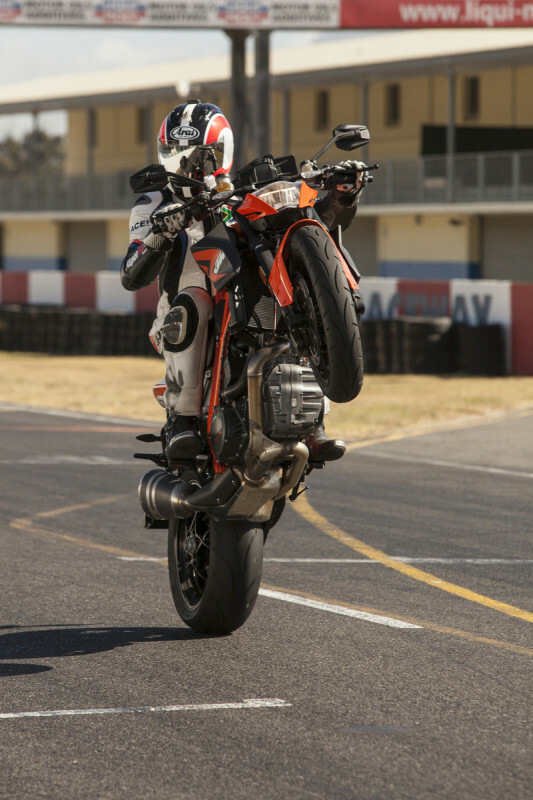 To pop a wheelie, the traction control has to be switched off entirely. The ABS can also be disabled. 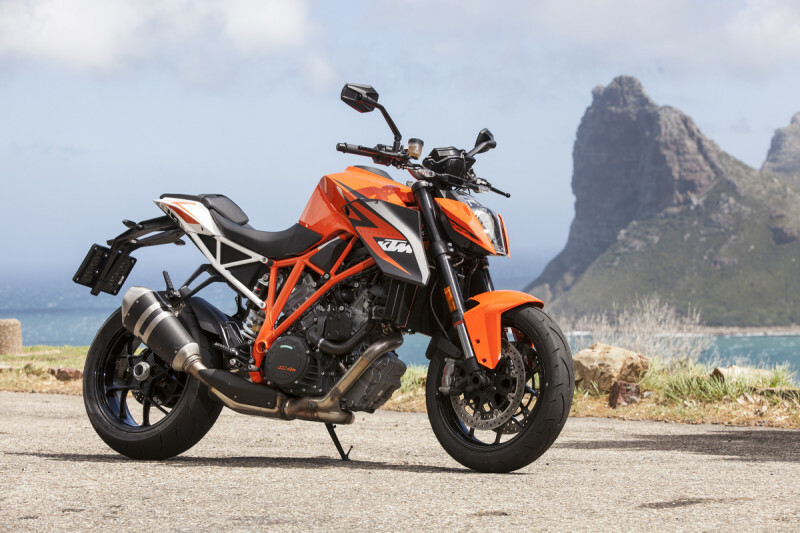 In spite of the bike’s (potentially) barbaric performance, its fuel consumption seemed quite civilised and I guess it won’t even use more fuel than a KTM 990 Adventure. Two things bothered me: I expected the slipper clutch to prevent a bit of back-wheel lock-up that I experienced on Killarney Raceway’s turn two when I was too fast for second gear. I would also have appreciated a wider gear lever for easier up- and downshifts. Even though it has the beastly image of the Incredible Hulk or at least a Boksburg bodybuilder high on steroids and Monster energy drink, the Duke retains enough royalty to be (surprisingly) comfortable to ride. It looks extremely compact, yet accommodated my 196cm frame easily and comfortably. I can imagine myself dropping more cash for the touring accessories and getting strange looks from GS riders. But the Duke R wasn’t conceived with water crossings in mind. No, it was made for teleporting. That’s how quickly it jumps from one apex to the next. The way in which it changes direction made my eyes go wide. I don’t mean this metaphorically, because I could feel the skin on my forehead move inside my helmet. Forget ride-by-wire. This is ride-by-thought. Shove your chest against the angular fuel tank and the bike feels even smaller and nimbler. And all the time you’re aware of the lightness of the thing. Owners who take their track days seriously will no doubt experiment with the very adjustable WP front and rear suspension. These tweaks can be done manually, by turning plastic knobs. If tank slap keeps you awake at night you can rest assured – the Duke is fitted with a steering damper. Twin-disc brakes with four-piston calipers at the front and a single disc with two-piston caliper provide good feel and ample stopping power. 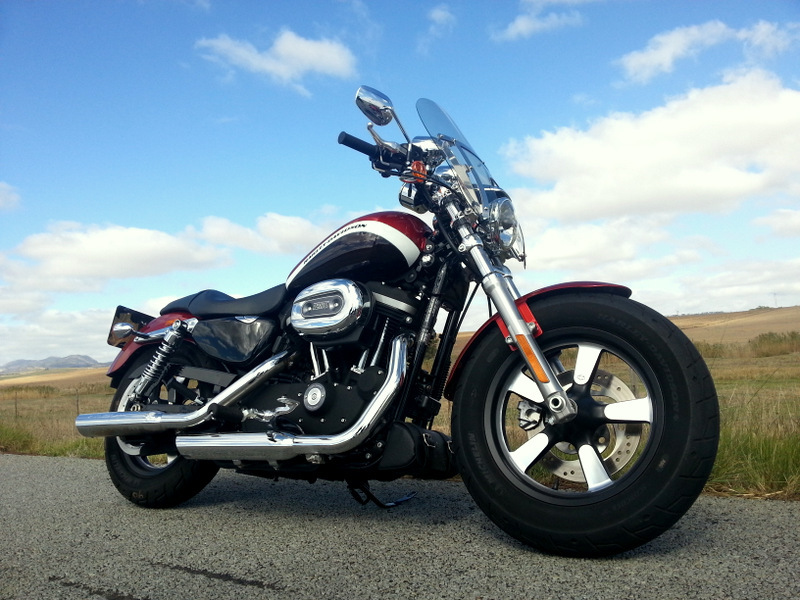 Likes: The bridled savagery of the engine, the comfortable ride as well as the design style. Warranty and servicing Two-year warranty, unlimited mileage. Two-year AA-road assistance included. Service intervals every 15 000km.